Ultimate Fighting Championship (UFC) is bringing combat sports fans a championship doubleheader at the upcoming UFC 227 pay-per-view (PPV) event, scheduled for Staples Center in Los Angeles, Calif., on Sat., Aug. 4, 2018. In the UFC 227 co-headliner, longtime flyweight champion Demetrious Johnson will give Olympic medalist Henry Cejudo another crack at the crown, after delivering “The Messenger” his first pro defeat way back at UFC 197. 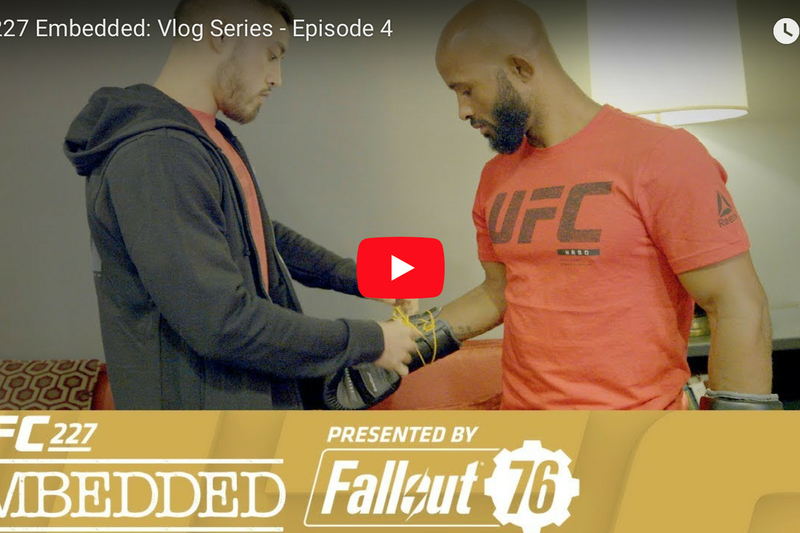 To get fans hyped for this weekend’s face-punching extravaganza, the promotion has released episode four of its popular “Embedded” video blog series focusing on all four main and co-main combatants. To watch episodes one, two, and three of UFC 227 “Embedded” click here, here, and here. MMAmania.com will deliver LIVE round-by-round, blow-by-blow coverage of the entire UFC 227 fight card on fight night (click here), starting with the Fight Pass “Prelims” matches online, which are scheduled to begin at 6:30 p.m. ET, then the remaining undercard balance on FX at 8 p.m. ET, before the PPV main card start time at 10 p.m. ET. For much more on UFC 227 click here.